Welcome to Airglide Moving Systems Inc.
with its 2 year full warranty - Allows you to move heavy appliances easily...on a cushion of air! 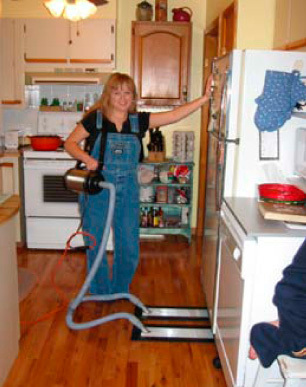 The Air Dolly, with its 8'x36" dual vacuum platforms, is a powerful, light weight mechanism which utilizes hovercraft principles for easy and safe movement of commercial washers and dryers, office equipment and household appliances without damaging floors. The Dual Air Dolly, with its 1.75 HP blower, makes it possible for you to move loads weighing up to 700+ pounds on your own. Eliminates costly damage when installing a new floor. Saves time on the job. Permits a one-man installation, makes it possible for you to move loads weighing up to 700+ pounds on your own. Reduces physical efforts and lessens the chance for injury. Adds a professional touch to every job. Complete with extra strength cotton bag. Includes four 8"x36" carpet adapter. Copyright © 2019 AIRGLIDE Moving Systems Inc. All rights reserved.